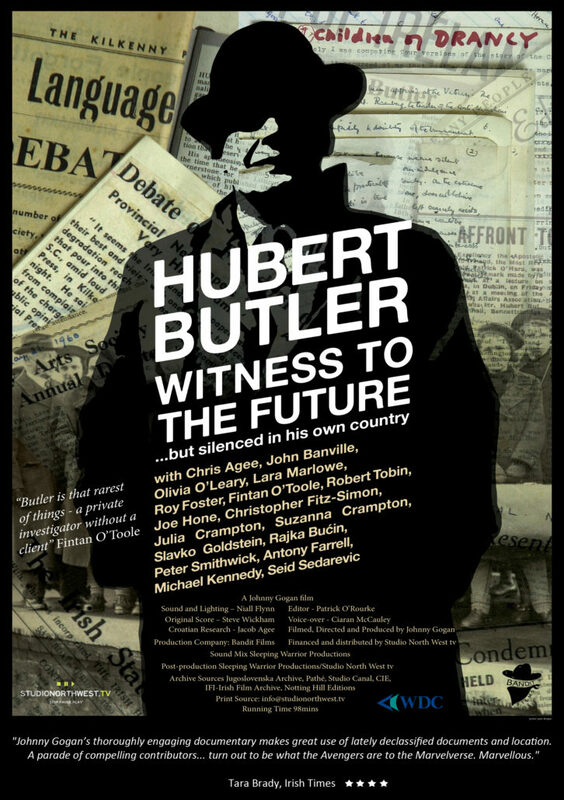 Born and raised in Kilkenny, Hubert Butler (1900-91) – once described as “Ireland’s Orwell” – is now widely considered one of the great essayists in English of the twentieth century. Proud of his Protestant heritage while still deeply committed to the Irish nation, he sought in his life and writing to ensure that Ireland would grow into an open and pluralistic society. His five volumes of essays (The Lilliput Press) are masterful literature in the tradition of Swift, Yeats and Shaw, elegant and humane readings of Irish and European history, and ultimately hopeful testimony to human progress. In this unique and remarkable film by one of Ireland’s most innovative film-makers, Butler’s life and work are brought to the big screen for the first time. The film follows his writer’s journey from his Anglo-Irish childhood and study at Oxford; through his time in Stalinist Russia (where he worked as a teacher), Nazi Germany (where he helped expedite the escape of Jews), and interwar Yugoslavia; to his later life as a market-gardener, writer and public intellectual at Maidenhall, Co Kilkenny, where his family had lived for a century and a half. Widely travelled in the Balkans, Butler wrote on a wide variety of subjects concerning his experience of the region, much of which remains deeply relevant to the recent history of Croatia, Serbia and Bosnia. He lived in Yugoslavia between 1934 and 1937, and spoke Croatian fluently. Many of his Balkan essays deal with the genocidal Croatian quisling regime (1941-45) and the collaborationist role played by the Catholic Church and, particularly, by Archbishop Stepinac – a topic which embroiled him in a major controversy in 1950s Ireland, and continues to polarize the political and cultural life of independent Croatia, where Stepinac’s proposed canonization has yet to be progressed. Historian Roy Foster, poet Chris Agee and biographer Robert Tobin lead the film’s impressive line-up of literary contributors. Steve Wickham (of The Waterboys) provides an original score with a suitably Balkan flavour, whilst the film’s historical sweep is assisted by rich archive footage. The publication in August 2016 of Butler’s sixth volume, Poteen in a Brandy-cask: Yugolsav Essays, by The Irish Pages Press (in association with The Lilliput Press), has been timed to coincide with Witness to the Future and its autumn tour of Croatia.